What Does 20-20 Vision Mean and How Is It Measured? Eye doctors tend to throw around the term "20/20" quite a bit. Often times, without thinking, eye doctors and eye care technicians use the term 20/20 without really educating their patients about what it actually means. “Mr. Smith, you have 20/20 vision...isn’t that fantastic?” Most have come to understand that having 20/20 vision is adequate, normal or at least a good thing. Ever watch the news program, 20/20? It is a great name for a news show that aims to shed light or a very clear view on certain newsworthy stories. Human vision is complicated. Our vision is multifaceted but eye care professionals need some way to quantify or measure vision. If we can measure vision, we can tell how far away from normal it might be or how much correction must be prescribed to bring a particular person to what we consider as normal vision. It would be difficult to interpret vision if we just notated, “Vision is near normal” or “Vision seems okay.” That would not be the professional way to record our examination. It would be much more accurate to record someone’s vision as 20/30. This way, we could track over a certain amount of time how our vision may or may not change. To many people's surprise, an eye examination in its entirety is quite complicated. Because your eye and vision is part your brain and nervous system, there are many things on your doctor's check-off list. The first and maybe the most important measurement is our central vision, or central visual acuity. This is the part of our vision we use when we aim our eye right at something to view it. In the United States, we use the Snellen system of visual acuity. The top number, 20, refers to a standard testing distance in feet. Scientists decided on 20 feet because anything we are viewing that is 20 feet or farther is considered optical infinity. They came to that conclusion because of the way light waves travel and the way in which our eye focuses objects. In a normal, optically perfect human eye, the focusing muscle is in a totally relaxed state when viewing objects at 20 feet or farther. When things begin to move closer to our eyes than 20 feet, our eye begins to change its focus in order to keep them clear. Also, the Snellen system assumes that a normal eye has good acuity if it can resolve certain detail in a letter at 20 feet. Those details are described as the distance at which each element of a letter, for example, a letter E, has an angular height of one minute of arc. One minute of arc is equal to 1/60th of a degree. The entire letter makes up 5 minutes of arc. To understand this, you have to go back to geometry and draw out a triangle and measure the angle of the triangle. The large end of the triangle is a letter E, with five elements...the top bar of the E, a space, the middle bar, a space and the bottom bar of the eye. The angle is five minutes of arc for the whole letter and one minute of arc for each bar. So What Does 20/400 Mean? For an example, the bottom number in the term 20/400 is the distance at which the detail of each letter subtends one minute of arc. So, when a person stands 400 feet from the large E on the eye chart, each element of the E subtends one minute of arc. This became the standard because the human eye and neurological systems in the brain allow us to easily discriminate between letters with features that subtend one minute of arc. Another way to think about this is to say that if someone is measured to have 20/50 vision, then that person has to move up to 20 feet to be able to resolve the smallest detail in a letter, whereas their completely normal friend can stand way back at 50 feet and resolve the smallest detail. If you think about it, most of the exam rooms optometrists use are not 20 feet long. Interestingly, simply putting up a mirror simulates the 20-foot long testing distance quite well. If a room is ten feet long, putting up a mirror to project the eye chart makes the room appear 20 feet long to the eye. Optometrists have gotten very good at calibrating eye charts according to the exact distance from the patient’s eye to the mirror and then from the mirror to the eye chart projector. With the advent of computerized eye charts, the calibration is even easier. We have to determine 20/20 vision to be the average normal vision. However, as with most measurements in health care, there is a normal “range” of vision. Some of us may see slightly less than 20/20, say 20/25, and some of us may see better than 20/20, say 20/15, and still be considered normal. 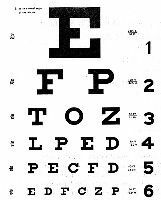 Most eye charts are designed to project a letter size as far down as 20/10, as it is rare to find a person that sees better than 20/10. The resolution of our central vision is similar to a high-resolution computer monitor. If the pixels are very fine and close together, the resolution of the monitor is better. TV manufacturers actually study visual acuity. There becomes a point where a certain resolution of a TV that is higher than the best human visual acuity will not make a difference. If the resolution of a TV is better than what the human eye can resolve, what is the point? SOURCE: Clinical procedures in optometry, Eskridge, J, Amos, J., Bartlett, J., JB Lippincott Company, 1991.